Provides a degree of posture control as well as pressure relief. 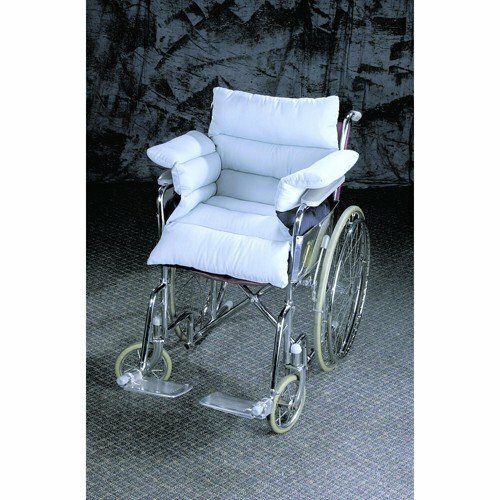 Fits the seat and back of the wheelchair and also cushions the armrest and side panels to protect the user from skin tears and bruising. Made of durable cotton/polyester, latex-free, reversible material with Dupont Dacron fiber padding for comfort and heat reduction. Use polyester side for incontinent situations. Machine wash warm water and air dry. The Wheelchair Liner was delivered promptly and was exactly what I was hoping for: comfort for Mom in her wheelchair. The pad holds her upright and she does not slide down. I was also impressed by how easily I was able to wipe off dried spilled food from the fabric. The only thing that would have made it perfect is if the fabric were patterned instead of a solid light blue. A pattern would hide spills better whereas the solid color shows every little dropping. I believe Mom is very comfortable as it also cushions her arms on the armrest.